Twice-baked potatoes, with a samosa-style filling – who needs Indian takeout when you can make these samosa baked potatoes at home? 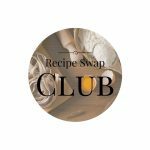 It’s that time of year again, where the Recipe Swap Club is up and going again. For those of you who are new to the cookathome family, I am part of a group of food bloggers, where every month we are assigned another person’s blog to re-create one of their recipes and post about it on our own websites. I’ve had lots of fun finding out about other food blogs as part of this, and have discovered quite a few new recipes along the way. Just like this smoky acorn squash soup, harvest vegetable beef stew, and marinated bbq pork chops to name a few. And I can’t forget finding this recipe for macaroons that I adapted into mint chocolate french macaroons – which is now a firm family favorite! 1. Where do you live? And does it influence your cooking? I live in Southern Oregon on the coast in Coos Bay. This has a lot of influence on my cooking, as I really like to source local and cook according to the seasons. I’m really lucky, as Southern Oregon has a lot of agriculture and we have a little community about 30 minutes from where I live (Langlois, Oregon) that has some beautiful farming going on. I get a weekly community supported agriculture share and get to dream up how to use all the great produce and then often go to the farmer’s market and other local markets to get additional products. I don’t really have one. I will say that the dish I have been cooking over and over again this summer is a zucchini and corn pancake. I absolutely love it for either breakfast or dinner served with a fried egg with a runny yolk. 3. What do you do outside of cooking/blogging? I have a full time job as an administrator at a community college, so that takes up most of my time. I’m really lucky, as my college has an outstanding culinary program, so I get to sample some pretty awesome food. I do also enjoy reading, playing with our dog, and walking the beach with my husband. 4.What made you start a food blog? I had coworkers at my prior job always asking about my lunch because it always smelled so good. I was always sharing recipes. I also was inspired by some of the wonderful blogs that have been around for quite awhile, like Heidi Swanson’s 101 Cookbooks. I thought it would be fun to start my own blog – little did I realize how much time it takes to build a quality site. I’ve been blogging now for almost two years – I love how this has let me connect with other food-minded people. I also love the aspect of continuous learning – I’m always learning new things about cooking, about photography, and about developing a website. 5. Who is your favorite celebrity chef? I’m a huge fan of Alice Waters. I’m inspired by her very local food approach. It’s ironic how things turn out sometimes. As some of you know, we just recently purchased a Traeger grill – for smoking and grilling – and we love it a lot. We had planned to make some pork loin for dinner one night, and I’d put Grant in charge of the meat. I was just planning on having some salad as a side, but he then mentioned he had a ‘hankering’ (translate: craving) for some twice-baked potatoes. And I remembered seeing this recipe in Ali’s blog for twice-baked samosa style potatoes. Just that little bit different to my normal cooking, and a little bit of a challenge for me to make in the time allowed to get the whole meal on the table at the same time. 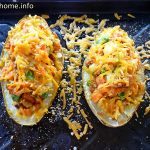 And the filling is more than you will need for the two baked potatoes – so use the leftovers in grilled sandwiches, or omelettes … or make some more potatoes! Thanks Ali – this is now going in our regular meal plan! Scrub the potatoes thoroughly. Put the potatoes on a baking sheet and bake in the oven for an hour or until potatoes are soft. Once potatoes are cooked, set aside to cool. In a cast iron or non-stick skillet, heat 2 tablespoons of olive oil. Add the onion, garlic, celery and carrots and cook, stirring frequently, until the vegetables are soft. Add the peas and cook until the peas are thawed. Add the mustard, salt, ground ginger, curry powder and cumin and stir until all the vegetables are coated and put the spice and vegetable mix in a medium sized bowl. Cut the potatoes in half and scoop out most of the potato. Leave a ¼ inch layer of potato in the skins to keep them stable for stuffing. Combine the potato with the vegetable mix in the bowl and combine. Stuff each potato skin with a portion of the vegetable and potato mix. 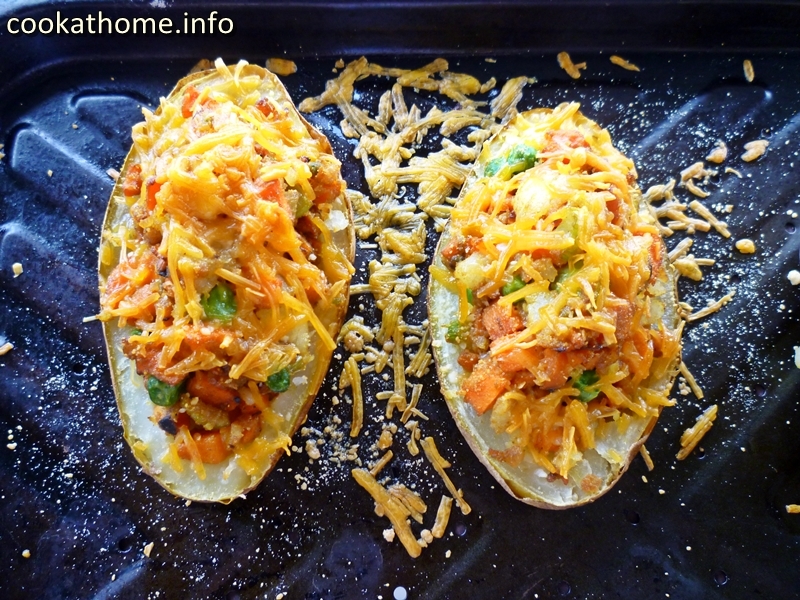 Sprinkle the top of each stuffed potato with about an 1/8 cup of parmesan cheese or nutritional yeast. Put the potatoes back into the oven at 350 degrees for 10 minutes. Switch the oven to broil and broil the potatoes for 5 minutes, until the tops are browned.